TheBlueGuerilla: Andrew Le Hegarat in Tory Youth National Chairman Bid Telling Members to 'Chill Out & Get a Grip'. Andrew Le Hegarat in Tory Youth National Chairman Bid Telling Members to 'Chill Out & Get a Grip'. LONDON South-East Conservative Future (CF) Deputy Chairman, Andrew Le Hegarat has sensationally launched a bid to become the next National CF Chairman, "in reaction to those who care more about their egos than the effectiveness and success of the party", TBG can exclusively reveal. Le Hegaret's will join battle with Alexandra Paterson and Jacob Wilkinson for CF's top job, potential candidate Alexander Stafford was not returning calls to TBG. Andrew told TBG that he believes "CF takes itself far too seriously", and it is "having a detrimental effect on the way that the organisation is seen". Particularly, he points out, by "potential members who share the values and ideas of CF but are put off by the infighting and egos". 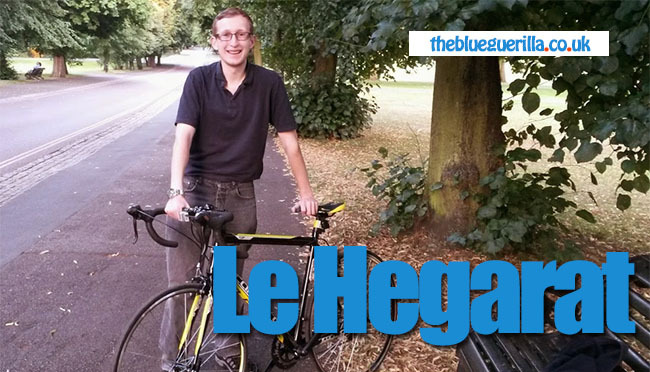 Le Hegarat has twice stood for election to Maidstone Borough Council in 2010 and 2012, and as Deputy Chairman (Political) of London South-East CF he has helped organise campaign days across the area to try hold onto many marginal council wards. Andrew Le Hegarat exclusively told TBG - "I got involved with CF as a way to pursue an interest and meet new people. What I’ve seen from the leadership of CF over the last few years is an institution that cares more about egos and fancy titles than achieving something. I’m standing because I want a CF that delivers for its members and the wider general public, not for its leadership. It’s about time that someone with a bit of real-world experience should lead CF through this next year, and I am the best person to offer this. The best way for CF to assist in a Conservative majority in 2015, is by choosing a leader who understands and has experienced the problems faced by real people." "Andrew Le Hegarat has sensationally launched a bid to become the next National CF Chairman, "in reaction to those who care more about their egos than the effectiveness and success of the party"
Say no more; you've got my vote. Do senior CF members have large egos? Probably! However, it's a big part of the job and he needs to be able to balance between being well known and different! If he puts his mind to it, he could been in competion to beat Paterson! We all know she doesn't care about Politics and just enjoys sleeping around on Road Trips! If played right, he could be in a chance with winning! Especially if he join Wilkinson in a negative 'dirty' campaigning of Paterson! Who? On his website he calls himself a "real person", classic out-of-touch line. Thats not what I call a manifesto, it's just a cheap bit of spin. Sounds good to me - we need someone who isn't part of the usual clique. People are put off CF, if he thinks he can change its image then he must be better than the HQ stooge line-up. Wait, is this guy seriously running on an anti-campaigning platform? His 'manifesto' has to be a joke! When are the elections actually taking place? Plus, how do we register our vote? Who was couped by a YBF trooper. He quit because fried chicken's super. I agree a joke indeed u know what they say power corrupts absolutely. After having observed Mr LeHegarat's early methods of gaining political trust i would add bluntly that he has little or no real life experience or wisdom to impart and therefore i believe is jumping the gun by a good 5 years atleast bless u for having the right amount of ego needed for the job though!